Road-going Turbos and GT2s are derived from their race brethren, but much of the race car precision and rawness is lost in the name of civility and comfort, resulting in a numbed and impure driving experience. These solutions bridge the gap to restore your Turbo’s racing pedigree. By elevating performance and enhancing driver precision, their products will unleash your car’s true potential. 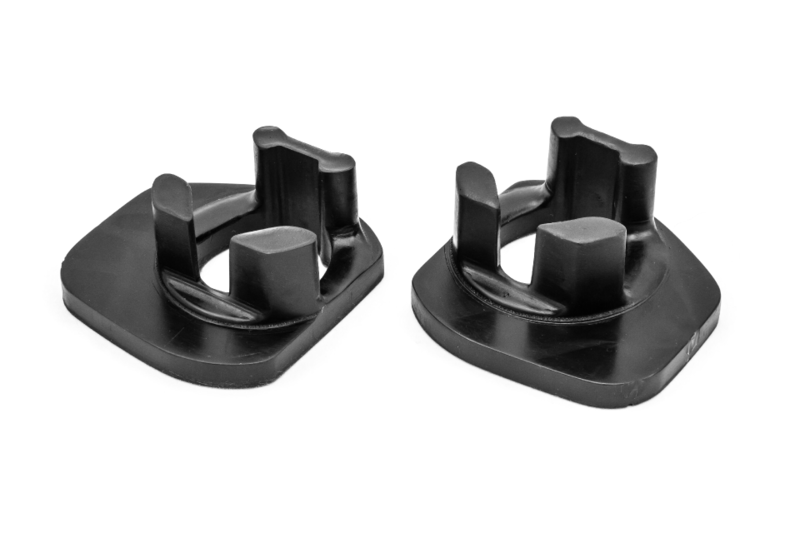 The OEM transmission mount was designed for ride comfort and is prone to sagging and tearing – and is detriment to performance. The empty voids allow for too much transmission movement, resulting in sloppy handling, numbed responsiveness, and imprecise shifting. Race cars utilize a solid metal mount, which is impractical for street use as it transfers excessive noise and vibration into the cabin. 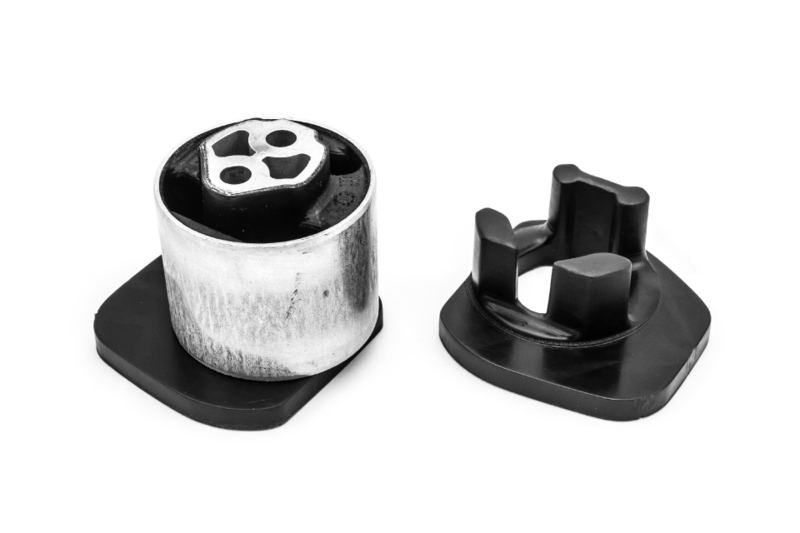 These durable urethane inserts simply slide in to fill and fortify the empty voids of the OEM mount, preventing premature bushing wear and undesirable transmission movement with minimal added noise and vibration. Handling is taut and predictable; power delivery is smooth; gear changes are crisp. Installation can be completed with basic hand tools in about an hour. Removing the stock transmission mount bushing is NOT necessary. 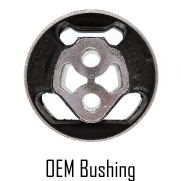 a) Although the inserts help prevent OEM bushing from tearing, if the bushing is already torn, it will need to be replaced. The inserts serve as a supplement to a good bushing. 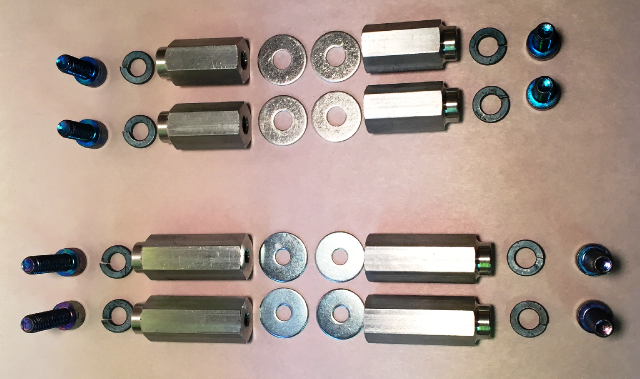 b) In some cases of extreme bushing sagging, a vise or C-clamp with adequate silicone based lubrication will aid in installation of the inserts. 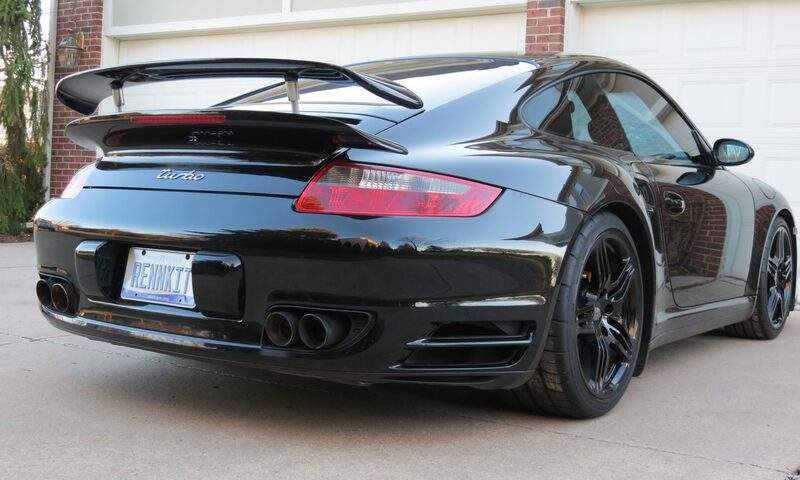 c) The 996 series bushings have a tendency to distort and sag over time. d) For 996 GT and Turbo applications, please make sure that you are ordering the correct insert for your transmission mount. Occasionally previous owners with failed OEM trans mounts replaced them with 997 bushings, which is different than the 996 turbo bushing. 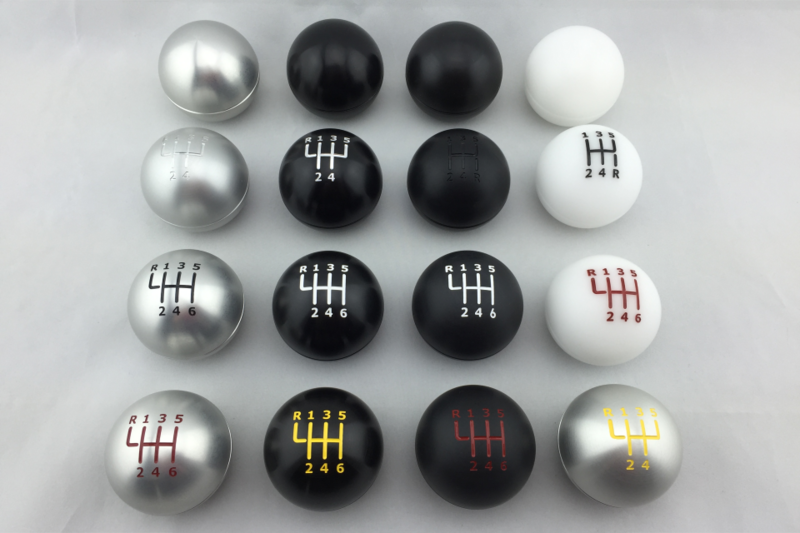 The factory shift knob is often overlooked as a source of sloppiness, but it shouldn’t be – comprised of rubber and plastic, the OEM knob separates and numbs the driver from the mechanicals. 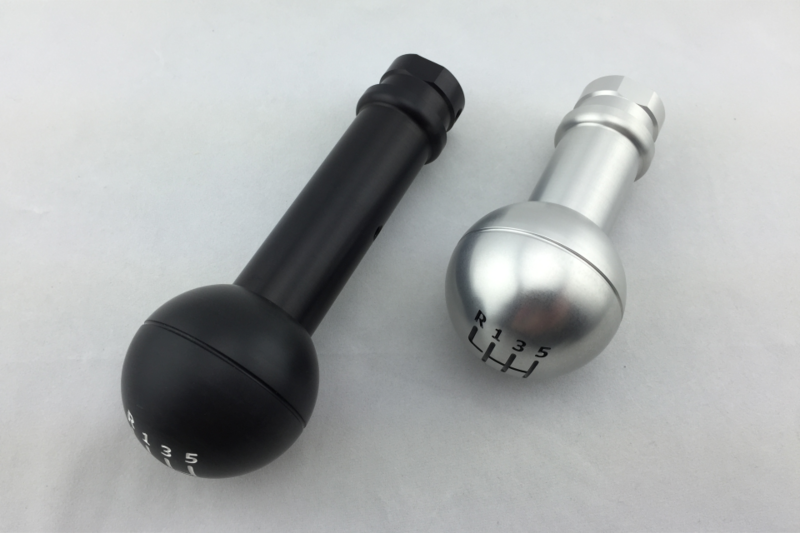 The Shift Knobs are machined from solid billet aluminum or Delrin to ensure that all shifting effort is transferred to the shifter. The 2 inch diameter knob fits firmly in the palm, with the circumferential cutout providing dexterity and enhancing grip. 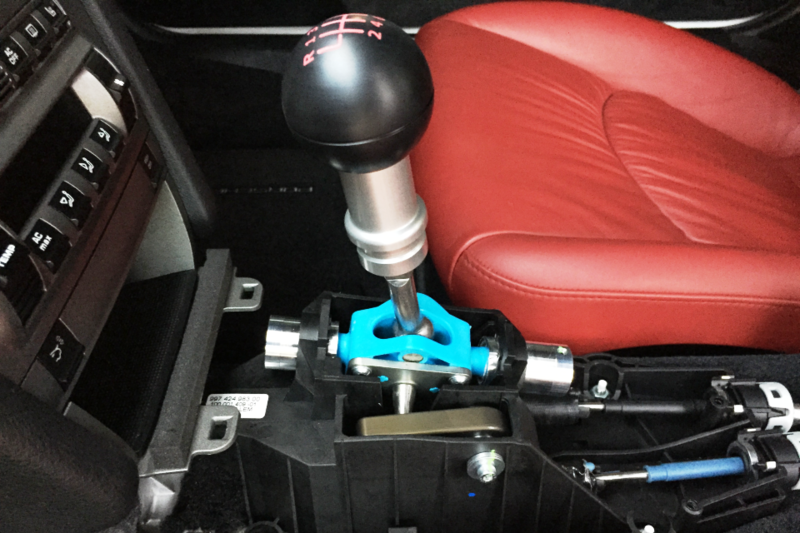 Both the short and long base shaft is designed specifically to fit Porsche’s rectangular shifter, attaching securely via high-hold set screws, and allows for seamless integration of the OEM shift boot. Shift pattern engraving and custom paint in the engraving is also offered for an added OEM look. NOTE: Fitment is for Manual Transmission vehicles only. 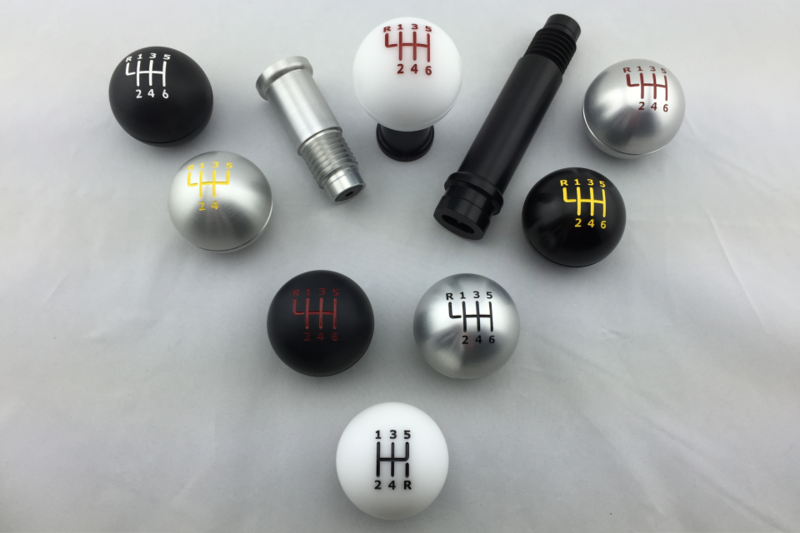 The Classic Shift Knob is designed to work with the OEM shifter – some aftermarket shifters may require minor modification for proper fitment, please contact us for details. Purchase price includes 1 shaft, 1 knob, and mounting hardware. 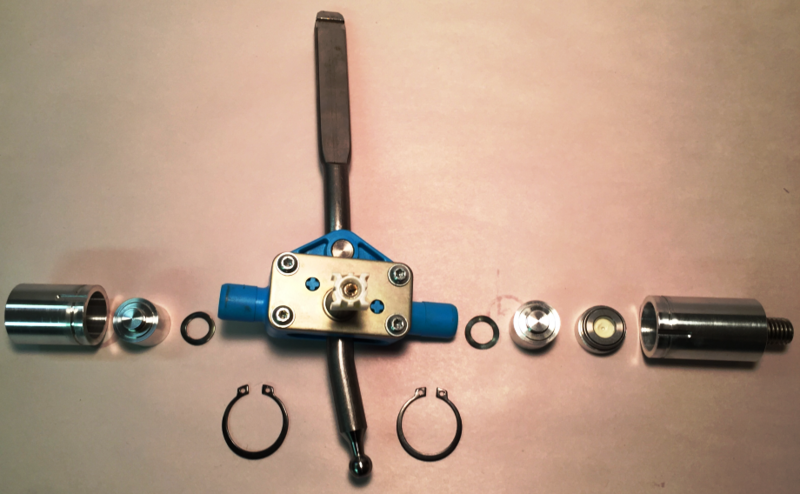 Lackluster shifting performance on a stock turbo can be attributed to the worn plastic bushings and pivot connections utilized in the shifter assembly. As these bushings require loose tolerances and free play to prevent binding up, they generate sloppy shifter feel. Moreover, the plastic and rubber construction flexes excessively which causes spongy gear engagement, especially on older turbos. 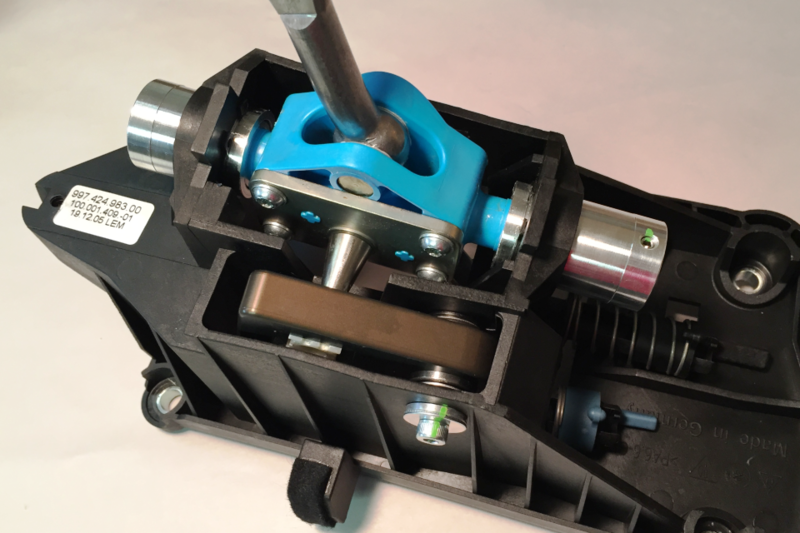 The SHIFT-RIGHT Solution replaces plastic bushings with ball bearings, eliminating flex and excess play that normally plagues the stock setup. Shifter feel is sharpened and gears engage with certainty. The kit is comprised of custom machined aluminum pieces, heavy-duty enclosed ball bearings, and hardware to entirely upgrade the factory shifter assembly. Additionally, the tightly toleranced shifter yoke is hard anodized for maximum wear protection and Teflon impregnated to further reduce friction. The OEM cradle and shift lever are retained with this setup so that shifter throw remains unchanged and the factory fit is preserved. 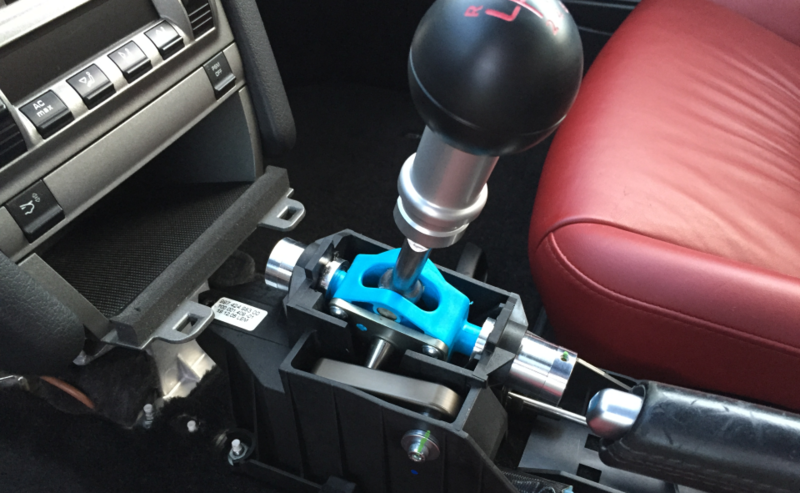 The SHIFT-RIGHT Solution is compatible with the Turbo OEM shifter, as well as most aftermarket short shift kits. Please contact us to confirm fitment for your particular aftermarket short shift kit. NOTE: Fitment is for Manual Transmission vehicles only. Choose model based on the type of shifter installed in your car, not necessarily your car model (ie. some 996 turbos have 997 turbo shifters installed). 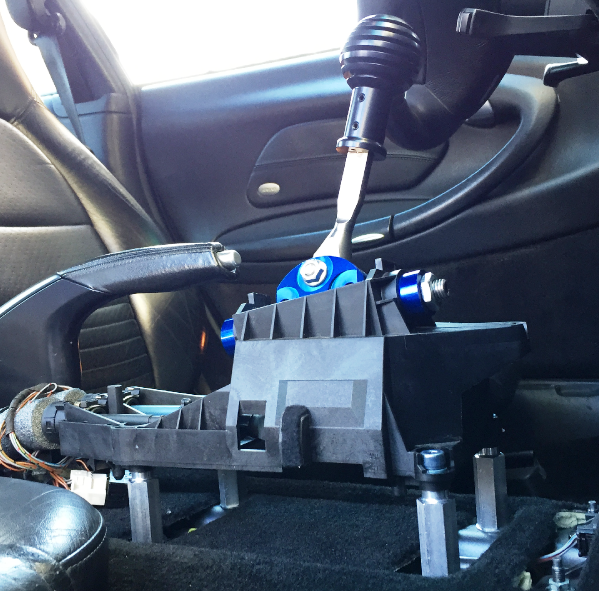 In stock form, the shifter is mounted too low – especially for vehicles that are raced or tracked. 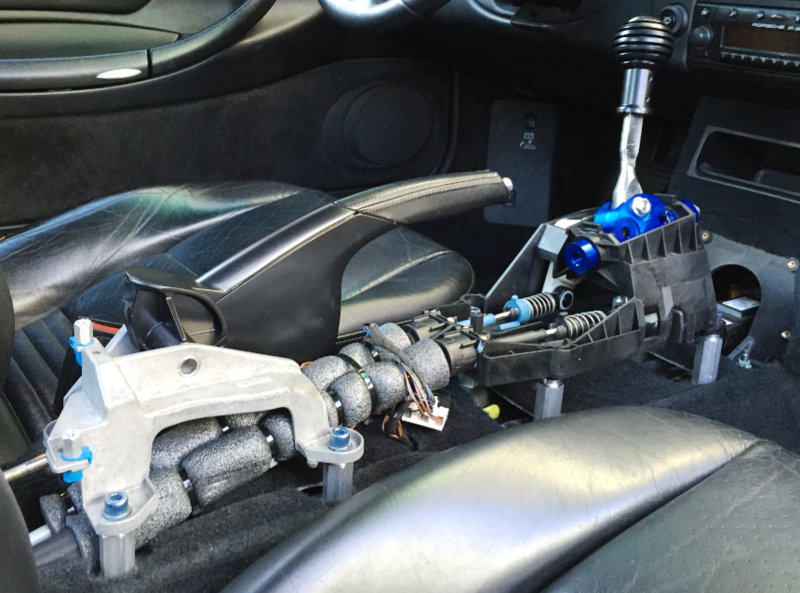 The Shifter Riser Kit raises the shifter 2 inches for enhanced driving ergonomics. Just like in the factory racecars, the shifter assembly is mounted onto aluminum hex standoffs, decreasing the distance between the steering wheel and shifter. Gear changes are now executed rapidly and assertively, and vehicle control is optimized by keeping the driver’s hands on the steering wheel longer. To keep the emergency brake intact, the 1.5 inch brake lever risers allow for shifter cable routing clearance, while the lower mounting height provides your shifting arm an unobstructed space. Note: The Shifter Riser Kit is designed to work with the OEM shifter cradle – please check for compatibility with other shifters before placing your order. This kit is designed for use in race or track cars with gutted interiors, and is not for use with the OEM center console. All items are drop shipped by Function-First. All orders for in-stock items will be shipped within three (3) business days via ground service. You will receive an email confirming your order has shipped, along with the corresponding tracking number. Should an item be out of stock, you will be contacted with an estimate of when the item will be ready for shipment. If that time frame is deemed unacceptable, you will be given the option to a) expedite shipping at your cost, or b) cancel your order for a full refund. Should you require expedited shipping services, please Contact Us prior to placing your order, detailing the shipping address and the shipping services you require. We will then email you an invoice with the expedited shipping charges included. In the event that you already purchased an item that requires expedited shipping, you will be sent a PayPal request for the additional funds which must be settled before the item will ship. For all items, returns are accepted within 14 days of item receipt for a refund, less a 10% restocking fee and shipping charges. To qualify, item must be unused and unopened, must be received back within 14 calendar days of original delivery date, and must have a valid Return Merchandise Authorization (RMA) number written legibly on the return package. Buyer is responsible for all return shipping costs. Please Contact Us to arrange for a return.